Add your own custom datasets to the dashboard. Our most recent development to Community Insight allows you to add your own datasets, created through Upload Your Data, to the dashboard. 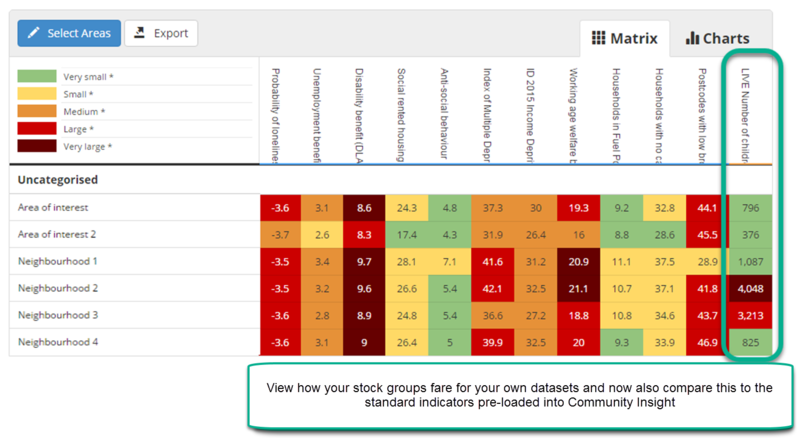 This means you are now able to see how your areas fare according to your own locally held data. Additionally, it means you are able to view and compare your own datasets to the standard indicators pre-loaded into Community Insight. This gives you another way of identifying patterns and trends between the data your organisation holds, and the range of open data available in Community Insight. This is something a lot of users were keen to see and we’re excited to see how people use this new feature in their daily work. You can add your own datasets to the dashboard in the same way that you would add standard indicators to the dashboard. Take a look at this Knowledge Base article on how to add your custom datasets to the dashboard. As well as extending the functionality, we have also made some aesthetic tidies to the dashboard too. The eagle eyed amongst you may have spotted we have removed the “Reports” icon from left-hand side of the map. You can still view all of you reports using the “Reports and data” tab at the top of the page. Removing the icon from the map has improved site loading times considerably – we hope that you can see the difference!